Made in 1968, Maurice Pialat's debut feature L'Enfance Nue (Naked Childhood) remains an affecting portrait of an under-discussed social issue that has never been amenable to easy answers or even comfortable dialogue. Processing certain aspects of the French New Wave through his own rather spartan cinematic prism, Pialat, who began his filmmaking career as a documentarian, portrays the turbulent youth of a foster child in a sequence of contrasting events that highlight both the promise of a human life and its fragile need for unconditional love. Pialat's film retains its painful immediacy both because it was crafted with such careful, touching restraint, and because the topic of "unwanted" children remains a near-taboo in the public sphere. A simple plotline conveyed in an economical 83 minutes, L'Enfance Nue tracks François Fournier (an appropriately enigmatic Michel Terrazon) from one foster family - the Joignys, who fear him - to another - the Thierrys, a pair of grandparents who provide closer, more caring attention. Despite a criminal streak that he can't quite fully shake, we witness François develop the ability to (mostly) distinguish right from wrong and identify who has his best interests at heart. Helping him along this path is the ardent bond he forms with Mrs. Thierry's ancient mother, Nana (Marie Marc), a spirited old woman who sees François for who he is - an intelligent young boy, not just a problem to be "solved." And in this last thought lies the crux of Pialat's argument - a position that is suggested ever so gracefully and without an ounce of uncinematic pedantry or polemic. Yet the treatment of François as a "problem" can arguably be seen as the root of his unspoken inner struggle. Between the agency responsible for his foster care and his first set of foster parents - not to mention his birth parents, who are evidently still around but unwilling or unable to raise their son - François is surrounded by an adult atmosphere of mistrust and anxiety. No one, until the Thierrys come along, is willing to treat him like the 10-year-old boy that he is. Instead, he is handled like a volatile time bomb that could go off at any minute; and that, indeed, is how he accordingly behaves - terrorizing cats and schoolmates, stealing watches, and throwing rocks at passing cars. Terrazon was perfectly cast. His cute, ferret-like face has an elasticity that can simultaneously harbor charm, love, and the desire to commit potentially dangerous mischief. His François is as unpredictable as the film's adults believe him to be, but when he is in the presence of that all-important unconditional affection - as with Nana - we see the unmitigated goodness beneath a troubled surface. Despite Pialat's belief in a basic goodness at Francois's core, this does not emerge in an easy-to-swallow way. The film concludes on a note of skeptical hope. Although François shows signs of a growing maturity, he remains erratically misbehaved, and the Thierrys come close to giving up on him. Still, his native intelligence and regard for the Thierrys give him something to build on - we only hope that the faceless institutions he must rely upon will not let him down once again. This beautiful enhanced 1.66:1 transfer by the folks at The Criterion Collection boasts rich color amid the gritty suburban settings chosen by Pialat. Costumes and interior walls are often brightly colored, in contrast to the grim outdoor locations. Detail is extraordinarily strong, as well, with no digital artifacts to speak of. The tight photography by Claude Beausoleil is efficient and deceptively simple. This low-budget, 42-year-old film looks fantastic. The monaural soundtrack has been attentively cleaned of hiss and other signs of age. It's a spare, clear track that favors dialogue and gets the job done. The Criterion Collection has assembled a very nice selection of extras for this single-disc release. We begin with the 1969 documentary Autour de "L'Enfance Nue" (52:29), which parallels the production of the feature with a report on the state of the French foster care system. It's eye-opening journalism, and is itself clearly indebted to the New Wave style. Next up is a short documentary directed by Pialat in 1960 called L'Amour Existe (19:53) that chronicles the depressingly stagnant life of young people growing up in the suburbs of Paris. It's thoughtfully photographed and intelligently constructed. Next is a short video discussion by Kent Jones (11:13) of L'Enfance Nue. This is followed by an interview of Maurice Pialat (15:35) himself, dating from 1973. The filmmaker talks about his approach and his purpose in making L'Enfance Nue. Finally, Arlette Langmann and Patrick Grandperret (6:24) talk about Pialat in a piece made in 2003, on the occasion of Pialat's death. Langmann co-scripted L'Enfance Nue and Grandperret was an assistant director. 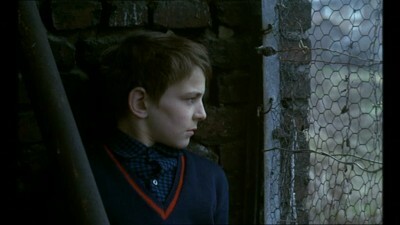 In content, style, and significance, Maurice Pialat's L'Enfance Nue hasn't aged a day. It remains an emotionally potent portrait of a childhood on the cusp of disaster. Pialat leaves François's fate open-ended, just as the nature of foster care systems everywhere remain fraught with unanswered questions of purpose and efficacy. The Criterion Collection has put together a stellar technical and supplemental package in addition to the fine feature. Highly Recommended.